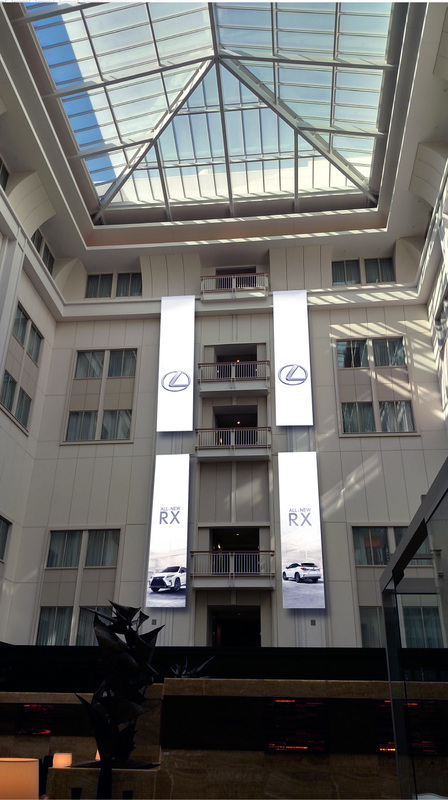 An up coming event showcasing the new Lexus RX at The Nines in downtown needed custom, large format work. A marketing firm on the east coast was organizing the event and was not located in town. Not only designed with the end client in mind, but the location of the event itself. A clean, classy look was developed which complemented both. Not only that, but all graphics and materials had to be removable with no changes to exsisting structures. Glass Enclosures - How do you make something classy, reflective of the brand, and not a visual block to a glass enclosure? With a custom pattern of course! After some brand research I noticed a common element: the grill of contemporary Lexus vehicles. Adopted easily into a seamless pattern that was eventually used as design element on other pieces. 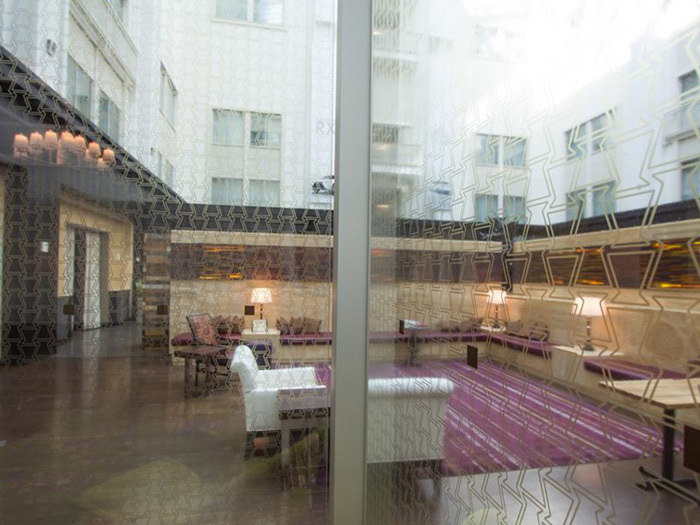 The staff at The Nines later said they enjoyed the pattern and regretted tearing it down. Glass Enclosures - Although slightly different, the second enclosure used the same pattern. To avoid confusion for installers and printer, a detailed install break-down was drawn outlining each panel. Walking map - A custom map, and icon collection was created for a unique print piece guiding visitors around Portland hotspots. Loose branding used elsewhere in the project tied this piece in to the overall look of the event. Details had to be detailed and upfront as the client was "hands-off" from the actual event. Shown here is the final mock-up. After graphics were approved, the measurements were taken to accurately represent the mock-up's look. Kind of reverse-engineering this element. Photos were provided by Lexus, and were bumped up in resolution for max quality on four very large fabric banners. Detail shot looking out of one of the glass enclosures through the pattern. Logo floor graphic - Measurements were key in the creation of all elements. 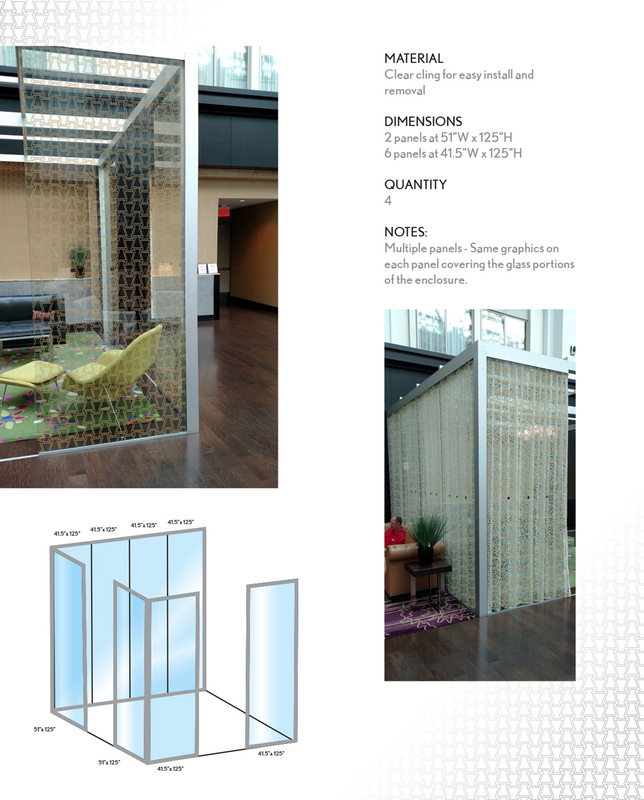 Space was limited, and accurately sized mock-ups were key to client sign offs. Above is the mock-up, below is the real application. Working closely with the installers for measurements, install guides, and feasibility studies was a huge help in making this a successful project. Here they are taking a much deserved break - they weren't afraid of heights either. Although not my work, this wall graphic still needed to be prepped and set-up for print. Measurements and reference photos were provided to another marketing agency who was also working on the project. Their graphic was reviewed and set-up for print and install.